New mayor Markey Butler takes the oath of office Monday along with Bob Sirkus and Bill Madsen (not pictured). SNOWMASS VILLAGE – The newly installed town council on Monday sent a clear message to developer Related Colorado that it’s no longer business as usual in Snowmass Village. In their first official decision, Mayor Markey Butler, new council members Bob Sirkus and Bill Madsen, and incumbent Chris Jacobson, unanimously voted that the remainder of the Base Village project, with the exception of the Limelight hotel, be subjected to a normal, three-step review process. The Limelight project was ripe for exemption from the sketch — or conceptual — step because it was reviewed in early 2014 before the application was originally withdrawn. It was resurrected this past summer by Aspen Skiing Co., which said it was reacting to overwhelming community support that favored a Limelight for Snowmass. Related Colorado had requested that the sketch step be waived for the entire Base Village planned-unit development application because it proposes no new uses, the mass and scale of the base area buildings remain the same and the community purposes established in a 2007 approval are still relevant. That would leave just two review steps — preliminary and final. 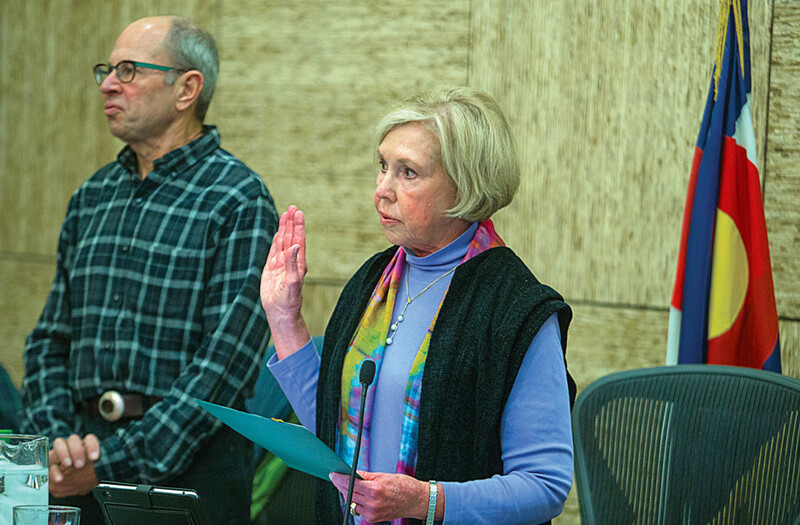 The four sitting council members disagreed, saying that changes in the community amenity were significant and have not been thoroughly vetted. The original “community purpose” was an aquatic center, to be located in an outlying section of Base Village. Recently, the developer proposed moving it contiguous to the Limelight hotel, though drawings show it more to be a pool than an aqua center. To augment this amenity, the developer has offered to provide free space to the Snowmass Discovery Center, which would showcase the Ice Age finds from Ziegler Reservoir that were first discovered in 2010. But the lack of detail was troubling to staff and elected officials alike. Former mayoral candidate Arnie Mordkin, who was on the original council that reviewed Base Village, implored elected officials to not feel pressured by the developer’s request. Mordkin asked council to consider the ramifications to dropping the sketch plan step, even though the developer had offered verbal assurances to the contrary. Jacobson also suggested that his colleagues show restraint, especially in light of the current lawsuit against the town by citizen Richard Goodwin. Goodwin’s suit, filed Oct. 28 under the Colorado Rule of Civil Procedures 106, alleges that ex-parte communications by two council members tainted the Oct. 6 vote that gives the developer four more years of vesting for the Base Village project. “We have litigation against the town relative to our previous decision,” Jacobson said, in recommending the council move cautiously. Council’s decision could potentially add three months to a development timetable that was originally expected to be complete by May 2015. In turn, that would delay infrastructure projects like the roundabout and the second phase of the Viceroy hotel for a year because of the limited construction seasons. But could it also halt the project entirely? Related Colorado CEO Dwayne Romero declined comment after the meeting. Earlier, he emphasized the need, “to keep forward progress and momentum” with this project. Similar messages were repeated throughout the evening by SkiCo President and CEO Mike Kaplan and Andrew Light, who said he is a partner in Sunrise Co., which has signed a letter of intent to develop fractional and vacation club units in part of the project. When asked if he thought the vote might endanger the project’s forward momentum, SkiCo Vice President of Hospitality Development Don Schuster suggested that this was the kind of decision-making that led to the Limelight application to be originally withdrawn. The sale of the land on which the Limelight would be built is contingent upon approval of the entire Base Village application. Editor’s note: Aspen Journalism and the Aspen Daily News are collaborating on coverage of Snowmass Village. The Daily News ran this story on Tuesday, Nov. 18, 2014.